All caught up with Day 1 and Day 2? Before we properly begin the day, we’re going to tell you that we’re going to be mentioning two different coffee shops, one we went to today and one we went to yesterday. The reason for this is, if you’ve read yesterday’s post, you’ll see that needed it own post, so we thought we’d do a quick mention in today’s one. 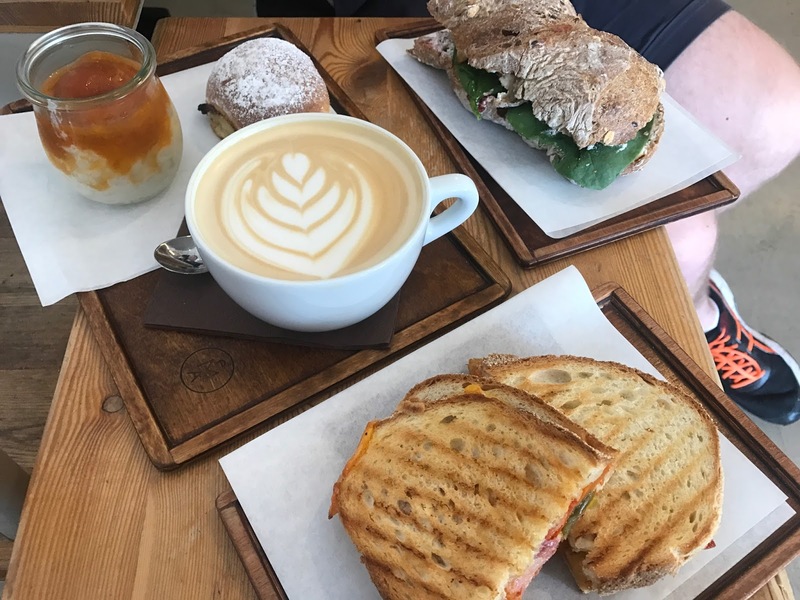 Yesterday – EMA Espresso Bar, were all about cute spaces and great coffee, with BeanThereAt‘s recommendations, we were not disappointed. I’m not usually a fan of regular iced coffees but this place has exceeded my expectations and the food was super tasty too, definitely filled that gap. With having starting the day pretty late, we ended up having our first meal at nearly 2pm. Outrageous isn’t it? It was much worth it though, as we’ve taken a leaf out of BeanThereAt’s book and have gone with their recommendation. Today – Misto, this was actually a different location to what BeanThereAt had suggested but the same company as they had kindly tweeted us saying they had this new location if we’re in the Prague Castle area and coincidently today we were, which you can read all about on our travel blog. Although it was late into the afternoon we both opted from breakfast dishes, so I guess you could call this Brunch. James getting a full English and I with poached eggs. Both deliciously good but is it just me who can’t bare the thought of getting a full English when you’re not in England? It’s just not the same right? But this one wasn’t too bad and not completely different I guess. Purely based on the fact that it was way past lunch time and we were basically having breakfast, we obviously thought it was the best idea to get a dessert to make up for missing out on the most important meal of the day! As always, James got the brownie and I opted for that ‘pretty thing in the corner’ which I clearly had no idea what it was, but it was worth the risk as it ended up being a peanut butter filling of a cronut. YUM. No regrets! Now, throughout the day we felt very settled and satisfied with our choice of brunch which kept us going for some time until we decided to stop for a nice little beer stop at this beer house we just came across. Sitting outside among the beautiful buildings, we could help but get a cheeky portion of chips. Just something to munch on while you’re drinking right? Then ended up us getting a burger and more fries to share. 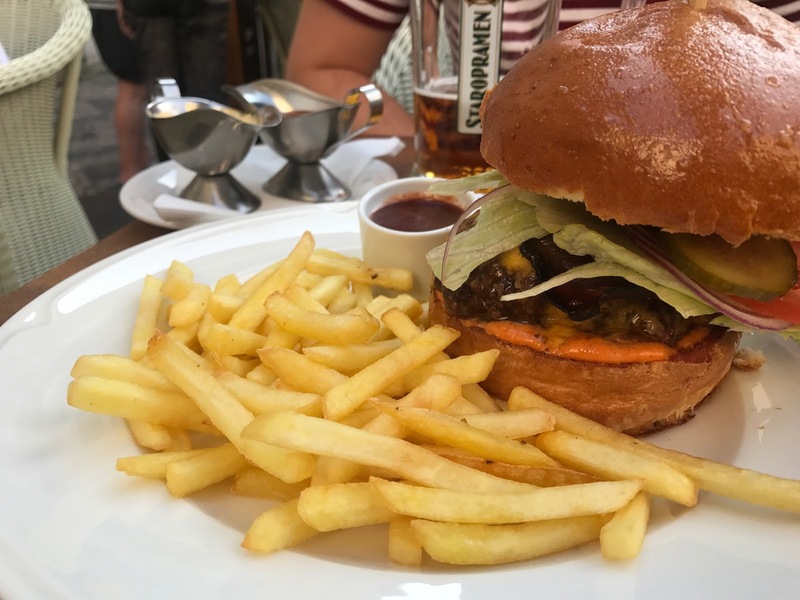 I know not your typical Czech dish but you can’t really go wrong with a burger and a beer can you? Keeping in mind we had something planned for the evening which requires a few hours without food, we still opted to share as we were only feeling peckish. 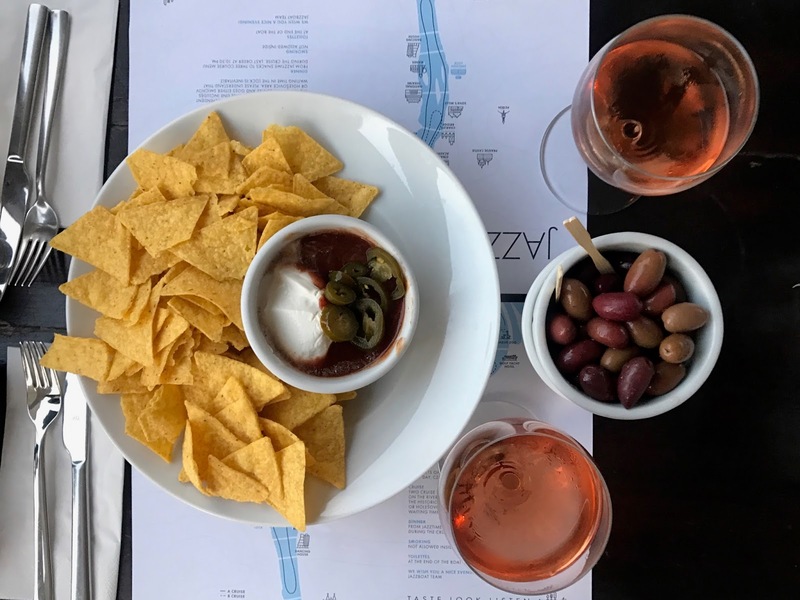 When the time came around, we did end up getting some nachos and olives to keep us going, as well as a full bottle of rosé wine, you can read all about our relaxing jazz boat evening here. We can only apologise that this isn’t the most exciting foodie post we’ve had yet but we’ve focused today more on the activity/travel side, so please do make sure to read that post too. It’s our last full day in Prague tomorrow and we’ve got a few exciting things planned. Make sure to come back to find out what we eat and get up to! I am completely loving coffee shops at the moment. Misto sounds great! I agree about full English breakfast feeling weird in a different country. I had one in Paris last year and it felt so completely different!I love the look of James' brownie and the nachos look great! Glad you enjoyed the recommendations and the trip to Prague, it's such a lovely city and vibrant for food and drink!